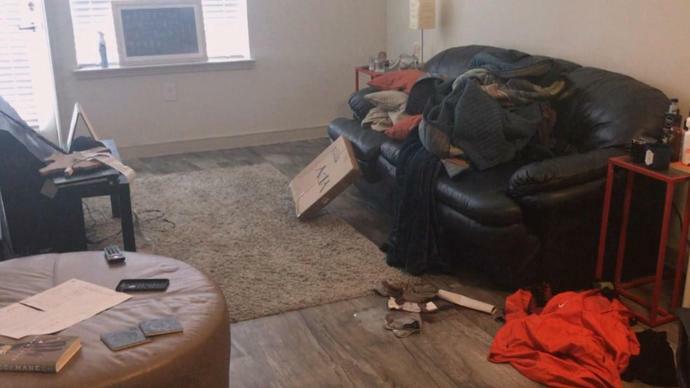 It's the first look inside the apartment where a Texas man was shot dead by an off-duty cop who mistook it for her own. It's a typical bachelor's apartment, complete with a leather sofa piled high with odds and ends. There's a bowl of cereal on the ottoman and a lone flip-flop on the floor. Botham Jean, 26, had been reading the autobiography of rapper Gucci Mane. Lee Merritt, the attorney representing Jean's family, came to the apartment building to investigate what led off-duty Dallas police officer, Amber Guyger, to fatally shoot him. "I went there to find some answers to what happened," Merritt told Inside Edition. "I didn't find anything that provided any clarity." Guyger claims that she thought she was entering her own apartment on the third floor, but had mistakenly entered Jean's on the fourth floor. Merritt said the hallways and doors on all floors of the building may look similar, but items like a potted plant in front of the cop's door could be used to tell them apart. There are no plants by the victim's door. In addition, Jean's apartment had a red doormat, while Guyger's had no doormat. After the shooting, Guyger claimed she had found Jean's door "ajar," but Merritt has pointed out that the apartment doors have a "sure slam" system and close automatically. Guyger has been arrested on a manslaughter charge and is currently free on bond.